The Harvard Signet Society has been promoting the intellectual, literally and artistic life at Harvard for quite a while (since 1870). We've been supporting their dinner for a somewhat shorter period (not yet a decade) but every year we enjoy the poetry, music, and speakers that make up a Signet dinner. We are less tempted by the two champagne bowls from which 170 very smart people drink. Asperger's Association of New England's first live webcast. AANE is a leader both regionally and nationally in fostering awareness, respect, acceptance, and support for individuals on the Aspergers and Autism spectrum, and on a recent weekend a part of that fostering of involved a live web presentation given by Professor Liane Holliday Willey. 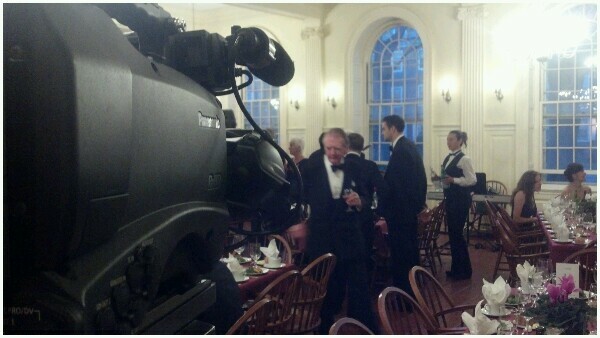 Productive Media was glad to be able to enable the AANE's first ever live web event. We brought our custom encoding rig, a wireless microphone setup and an HD camera to their offices, and with a minimum of disruption we were able to capture and share Mrs. Willey' story for the paying attendees who could not arrive in person. We also were able to archive the recording so that the AANE can post it to their website in the future. We're always happy when we can help another good organization get started in the live internet event space. Tara modeling our "Helmet" Camera.This weekend Boston Event Works, and Mr Youth, brought us in to help with some of the tech at the 2011 College Fest. Over the years, College Fest has grown into a pretty big event with a lot of moving pieces. This year we provided Chrome Books, MiFi's, DJ Gear, Wireless Microphones, Radios, Flat Panel Displays, Cameras, Post Production Services, File Hosting and Staffing . . . Not to mention a fair bit of know how and more than just a smidge of improvising. Yes, Those are fender washers and commodity hardware.Not wanting to let a client down, we uttered the phrase that so often escapes our lips: "I'll figure something out." A few ideas were thrown around--Gaffe Tape / Visor / Drill Press / Hard Hat--but in the end we solved the problem with a $6 trip to Home Depot, a couple of promotional hats we had in the closet, and Seth's Gerber multi-plier. College fest seemed to get a pretty good response this year, and we think that its high-energy, give-it-a-go attitude is a big part of that. We love the "Can We Do _____?" questions that come up in those environments, and we're looking forward to improvising something new next year. Heavenly Music at St. Paul's Cathedral in Boston. The Indiana University Jacobs school of music is performing "Sacabuche" (right now) at St. Paul's Cathedral near the Boston common. The acoustics are surprisingly good here so the performance really only needs a couple of 10" speakers to help "pop" the voices. And that works out well as we only had an hour to set up a PA system a 5000 lumen projector and a 10 foot wide screen. Fortunately with a good crew and some forethought you can accomplish almost anything. Greg Poulos of Bluefin Events needed a way to get a bright image and clear sound in a sunlit, crowded clubhouse at the Pinehills Golf Course. Oh, and a PA system that could handle a huge number of folks and still be out of the way of the servers, who used every door and path around tables. And the golfers. He and his client, the Clark Charitable Foundation were very happy with the results! It was a nice day for a drive to Pinehills, too. Even the "cheap seats" are important here. We were asked us to help out with the UMASS Lowell graduation today by providing four 50 inch plasma screens and a speaker system for their overflow tent. There was probably room inside the Tsongas center for the 45 or so people who for various medical, personal, or comfort reasons chose to enjoy the graduation against the backdrop of the Merrimack river, but thanks to UMASS, all of the other production companies and us they had that option. They came to us with an interesting set of goals: Two technicians and Productive Media President Geoff Briggs set up the tech table. Our encoding station can be seen in the office behind them. They wanted those presentations to be simultaniously available in their offices in Germany, California, and Washington, and they wanted managers in their Asia offices to be able to view the presentations at home. They also wanted the question and answer portions of all three sessions as well as the entirety of the most informative session to be availible for on-demand consumption within 24 hours. All that and the content had to remain unavailible to anyone who they didn't authorize. And of course nobody want to break the bank on these shows. We've removed the branding from this client's player. We aren't sure if we'd have to kill anyone for revealing their identity, but why take the risk? 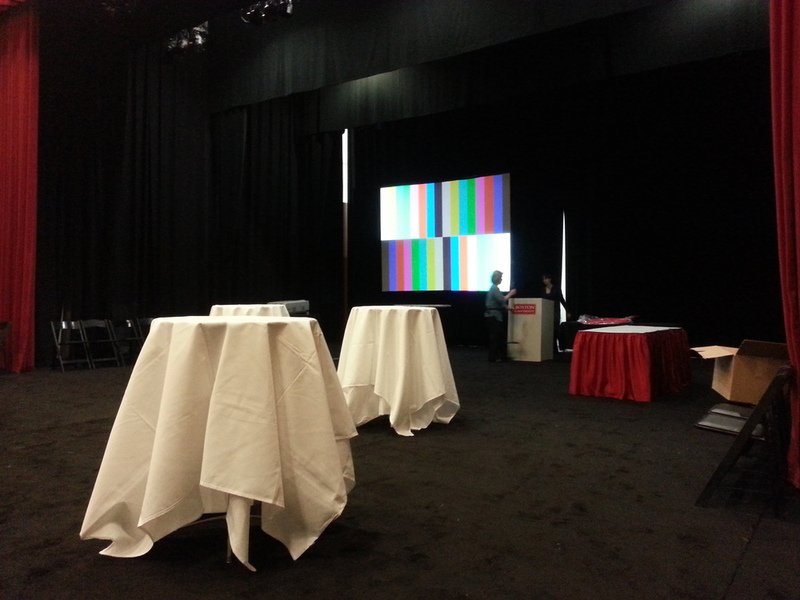 The two screen live program with audio re-enforcement is a pretty simple and cost effective show for us provide. We added an image maginification camera for the in-room audience, a custom encoding / streaming solution, and we partnered with our favorite live streaming content delivery network to provide the live version of the program to the web, which allowed each site to show the video, the powerpoint, or both together. We also created a custom player solution and partnered with a different and very robust content delivery network that focuses on the on-demand space to offer the same presentation as a hosted program, with the ability to skip around within the presentation. More importantly we made it modular, so this company can decide to expand upon their offerings, or we can quickly rebrand the solution for anyone else who might need this service. Seth G. Newell PhotographyWe got the chance to help get the Somewhat North of Boston Film Festival back on it's feet this year. We worked with Red River Theatres in Concord, NH to provide 3 video projectors, 4 wireless microphones, sound support, a media server, and much of the logistical support needed to make the festival happen. Seth G. Newell PhotographyThis years festival included 35 sessions in 3 theaters, over 60 films, a DSLR film maker meetup, live music, panel discussions, film maker Q&A sessions and a local food and beer tasting. A big part of this festival was flexibility and responsiveness, and Productive Media facilitated that by designing a media server and playback system that allowed the festival to respond to the viewers by scheduling "best of" and "encore" blocks on the fly. Our all digital delevery and playback system also allowed us to accept High Defination materials from more film makers than ever before, show advertisments and trailers for other viewing options, and individually identify each film and director prior to it's showing. The Asperger's Association of New England Conference begins, and Productive Media provides all of the projectors, screens, wireless microphones, cameras, switchers and lights for two Main Event Rooms and ten breakout rooms in two locations at the Royal Plaza Conference Center and Holiday Inn Hotel in Marlboro MA. The keynote and speeches for the first day were in the Conference Center Tent, while the breakouts were up the road at the Hotel. Planning and good communications were an absolute must for this event! Every year Fidelity Investments offers musicians in the Boston area local schools the chance to win the opportunity to perform at Boston's Symphony Hall. The students receive a gift card, rehearse with famous musicians, Broadway stars and directors, and culimate their experience with a fully produced concert event from the stage normally reserved for the Boston Symphony Orchestra. FutureStage tapped Productive Media to help record their special event with a full multicamera / multimedia production. We quickly pulled the tech team together to provide a multicamera production with projection and video playback. The night was a resounding success and we're pretty sure that those students will never forget it. Life is Good with Productive Media! Many of our clients love us for our ability to dig in and provide a custom solution that is the right fit for them, but when they are running flat out, some of them just want to know that they can pick up the phone, place an order, and trust that they can cross that item off of their list. This weekend with “College Fest” at the Hynes Auditorium and the inaugural “Life Is Good ” Festival in Randolph, MA, Boston Event Works was happy to pick up the phone and ask Productive Media to provide plasma screens, switching equipment, some projection gear and "a Tech" to help make sure both events were executed flawlessly. Productive Media provided plasma screens and switching equipment for Boston Event Works in the inaugural “Life Is Good ” Festival. We had one of our technicians stay on site for the event to make sure everything went smoothly – which it did! We also assisted them with projection for “College Fest” at the Hynes Auditorium on the same day!